Este edificio fue construido entre finales del siglo XVII y principios del XVIII. Se sabe que en 1725 unas monjas compraron la propiedad para ocuparse de las labores de la Parroquia - hoy Catedral - durante el Porfiriato. 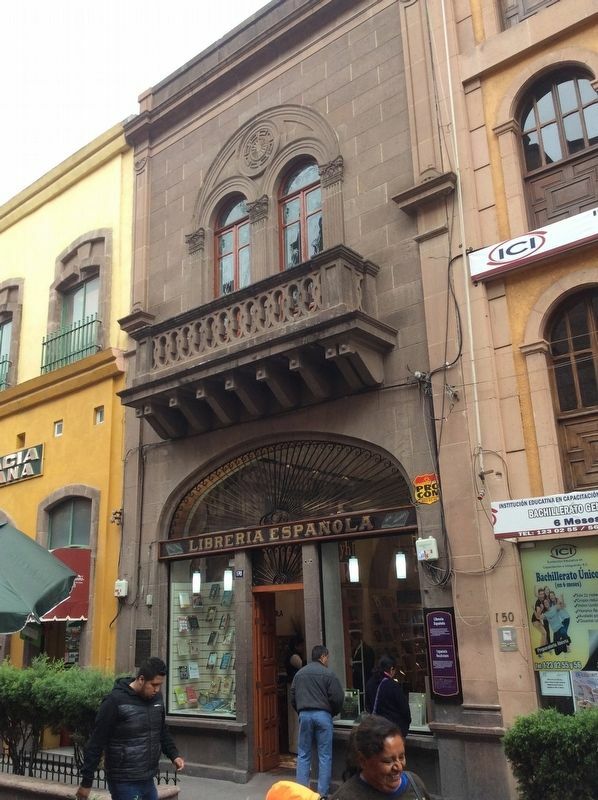 La Librería Española, propiedad de la familia Izquierdo, se encuentra aquí desde 1908. This building was built between the end of the 17th century and the beginning of the 18th. It is known that in 1725, nuns bought the property to take care of the work of the Parish church - now Cathedral - during Porfirio's administration. 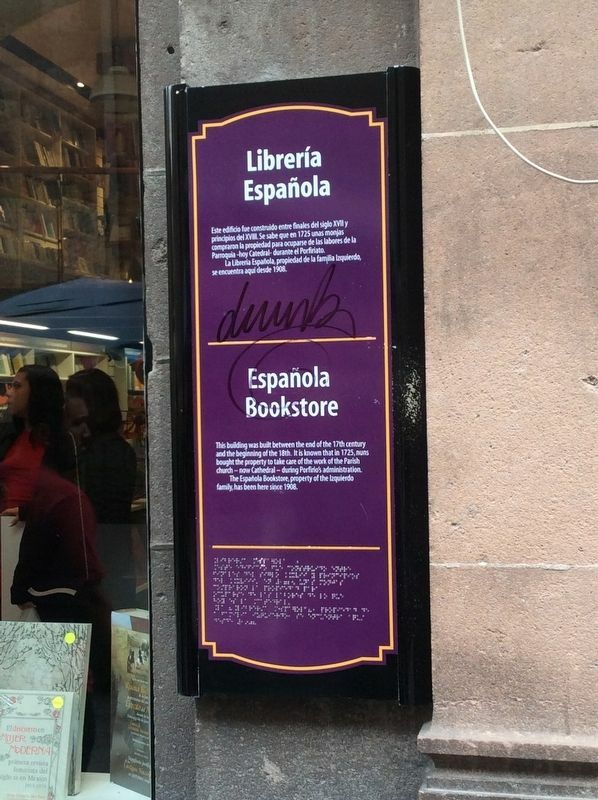 The Española Bookstore, property of the Izquierdo family, has been here since 1908. Location. 22° 9.089′ N, 100° 58.523′ W. Marker is in San Luis Potosí, San Luis Potosí, in Municipality of San Luis Potosí. 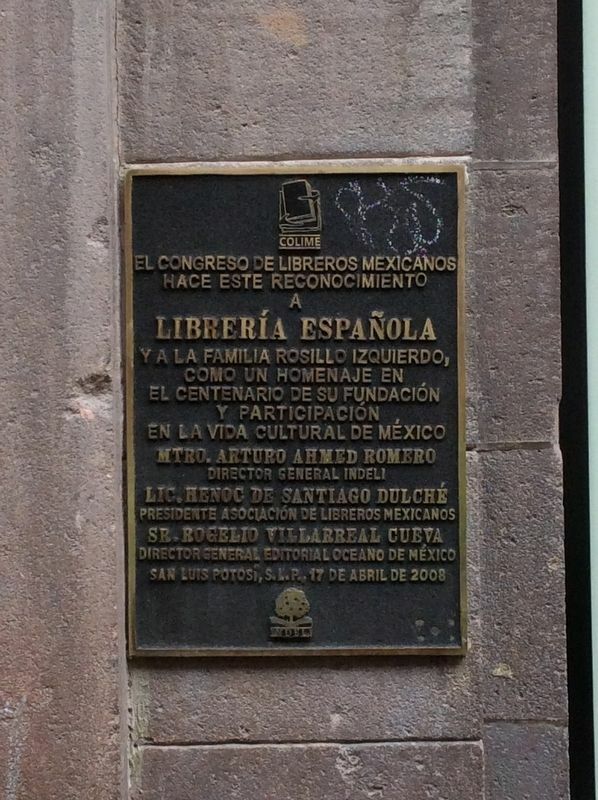 Marker is on Manuel José Othón just west of José María Morelos y Pavón, on the left. Touch for map. Marker is in this post office area: San Luis Potosí 78000, Mexico. Touch for directions. (within shouting distance of this marker); General Ignacio Zaragoza (within shouting distance of this marker); House of Don Félix María Calleja (within shouting distance of this marker); Al Libro Mayor (within shouting distance of this marker); Metropolitan Cathedral / Vicereine's Balcony (within shouting distance of this marker); Municipal Palace (about 90 meters away, measured in a direct line); Arms Square / City Hall (about 90 meters away). Touch for a list and map of all markers in San Luis Potosí. Regarding Española Bookstore. The marker mentions that nuns purchased the property in 1725 so as to take care of the parish church, now catedral, during the Porfiriato. However, the Porfiriato, or the extended period of Mexican history under President Porfirio Díaz, occurred from 1876 to 1911. More. Search the internet for Española Bookstore. Credits. This page was last revised on April 9, 2019. This page originally submitted on April 9, 2019, by J. Makali Bruton of Querétaro, Mexico. This page has been viewed 46 times since then. Photos: 1, 2, 3. submitted on April 9, 2019, by J. Makali Bruton of Querétaro, Mexico.